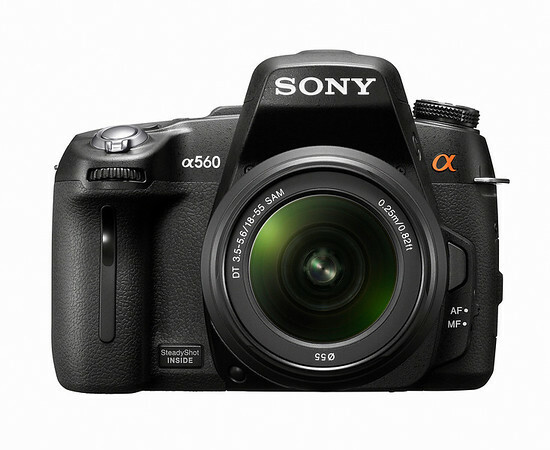 SAN DIEGO, Aug. 23, 2010 – Sony today introduced an α (alpha) DSLR camera (model SLR-a560) that leverages Sony’s Exmor ™ APS HD CMOS sensor to make it easier for active shooters to get the best shot without missing a moment. Along with the a33 and a55 cameras (also announced today), the α560 model is one of the only DSLR cameras with Multi-frame Noise Reduction, Sweep Panorama™ mode, 3D Sweep Panorama and Full HD 1920×1080 60i video capture. This 14.2 megapixel α560 camera offers the same features of its predecessor, the innovative α550, which introduced Quick AF Live View, 7fps continuous shooting and Auto HDR to the step-up DSLR class. Additionally, Sony is adding to its already strong line-up of more than 30 A-mount lenses with new models made for seasoned photographers and those new to the DSLR space. Today, Sony expands its A-Mount lens line-up for α DSLR cameras with three new lenses—a Carl Zeiss® Distagon T* 24mm F2 ZA SSM (model SAL24F20Z), a DT 35mm F1.8 SAM (model SAL35F18) and an 85mm F2.8 SAM (model SAL85F28). The α560 camera provides excellent picture quality, particularly in low-light scenarios. A new generation of Sony Exmor ™APS HD CMOS sensor employs low-noise processing for high-quality pictures. The BIONZ ® image processor has color-noise reduction that helps achieve low noise up to ISO 12800, without sacrificing fine detail. Multi-frame Noise Reduction stacks a high-speed burst of six frames, creating a single low-noise exposure that boosts effective sensitivity as high as ISO 25600. With Quick AF Live View, the α560 camera can focus just as quickly in Live View as when shooting through the eye-level viewfinder, which is unlike any other DSLR in its class. Because composing shots on the LCD monitor is becoming increasingly important to DSLR users, Sony has equipped this camera with two Live View functions and a 3-inch (measured diagonally) LCD screen that tilts 90 degrees up or down. The α560 has a high resolution 921,600 pixel Xtra Fine LCD™ display. Sony’s Quick AF Live View uses two sensors to maintain the same focusing speed as with the optical viewfinder. While the speed of Quick AF Live View is ideal for every day shooting, Focus Check Live View enables critical framing and magnification for setting precise focus in macro and tripod shooting. Focus Check Live View mode simplifies critical assessment of the finest image details. A real-time ‘feed’ from the main sensor can be viewed on the LCD monitor, with switchable magnification allowing close-up confirmation of delicate manual focus adjustments. Contrast AF method is selectable in focus check Live View mode. Temporary 7x and 14x zoom views enable you to focus on extremely fine detail while the 1x view shows 100 percent framing in the LCD. With its unique sensor-processor combination, the α560 camera is a leader in its class with up to seven frames per second shooting speed for under $1,000. Using the optical viewfinder, you can shoot up to three frames with Quick AF Live View, which helps you capture the decisive moment when shooting fast moving subjects like in sports. The α560 α camera offers the extra convenience of high-definition video recording. This model also captures Full HD (1920 x 1080i) video in high-quality AVCHD™ files that can be easily enjoyed on a compatible HD television via the cameras built-in HDMI™ terminal (cable not included). The camera includes built-in stereo microphones for high-quality audio recording. With multi-shot technology, the α560 camera’s high-speed sensor and processor rapidly captures and assembles many frames to realize unmatched low-noise, extended dynamic range, wide panoramas and 3D images. The α560 offers versatile creative control even when shooting movies. Creativity is also enhanced by the ability to apply white balance and Creative Style settings, as well as Aperture Priority (A) mode aperture settings, to movies. What’s more, exposure compensation can be adjusted even while movie shooting is in progress. Featuring Sweep Panorama technology, the α560 model captures breathtaking shots up to 180 degree horizontal or 126-degree vertical shots (18 mm focal length). With 3D Sweep Panorama mode, the camera can shoot 3D panoramic still images with a single lens. The high-speed burst of frames is stitched together using innovative processing techniques to automatically create detail-packed 3D panoramas. These files can be enjoyed in stunning 3D on compatible 3D televisions (other accessories are required). In-camera High Dynamic Range (HDR) has been further enhanced incorporating three shots. It can capture highlights, midtones and shadows. Unlike HDR features in other DSLR cameras, Sony’s unique positional interpolation technology can overcome slight changes in camera position and align individual shots so that a tripod is not required. The feature handles severe backlighting and other high-contrast scenes like looking out a window into bright daylight. The in-camera auto HDR technology combines the highlight, midtone and shadow detail of three separate captures into one remarkably natural looking image. The α560 offers a maximum Auto HDR range of 6EV. Multi Frame NR is a new function where, when the shutter is released, the camera automatically takes 6 frames at the currently selected shutter speed, aperture, and ISO setting, and then combines them into a single JPEG image with a reduction in noise at the selected aperture and shutter speed that is equivalent to approximately two ISO steps. In addition, ISO expansion achieves class-leading, ultra-high sensitivity equivalent to ISO25600, while accurate subject detection assures high-precision alignment of the 6 frames during compositing. The new camera accepts both Memory Stick PRO Duo™ (including Memory Stick PRO-HG Duo™) and SD (including both SDHC and SDXC formats) media (all sold separately). With a 30MB per second transfer rate, Sony’s Memory Stick PRO-HG Duo HX offers the best performance of all memory cards whether in continuous shooting mode or transferring data to other media. Made for experienced and budding photographers alike, the Carl Zeiss Distagon T* 24mm F2 ZA SSM (model SAL24F20Z) functions as a wide-angle 24mm lens on full-frame cameras with 36mm (35mm equivalent) lens sensors, or as a 36mm equivalent lens ideal for general use on cameras with APS-C sensors. Jointly developed with Carl Zeiss, it features the highly-regarded Carl Zeiss Distagon designed for wide-angle lenses. This lens is distinguished by its fast response focus and extremely quiet, very smooth operation thanks to its built-in SSM (Super Sonic wave Motor). It offers a wide and therefore highly versatile focal range from 0.19m to infinity, and features a nine-blade circular aperture that along with the large F2 maximum aperture contributes to smooth, natural bokeh effects. In keeping with traditional Carl Zeiss design, the all-metal lens barrel has been finished to a very high standard resulting in a visibly high-quality appearance. Offering photographers at all levels great value and performance in a compact and lightweight design, the new DT 35mm F1.8 SAM (SAL35F18) weighs just 6 ounces. It can be added to a lens kit system and carried without noticeably increasing the weight of the bag. With an approximately 50mm (35mm equivalent) focal length on an APS-C sensor, this lens is ideal for snapshots and portraits under a wide range of shooting conditions. The high-speed F1.8 maximum aperture is particularly advantageous for hand held shooting in low light. At just 0.8 feet, the DT 35mm F1.8 SAM (SAL35F18) has the shortest minimum focus in its class, making it an excellent choice for dramatic close-ups too. Whatever the shot, the internal Smooth Autofocus Motor (SAM) drives the focusing group directly and ensures responsive and fluid autofocus operation. The new 85mm F2.8 SAM (SAL85F28) lens is a full-frame lens in that offers performance and affordability. The 85mm focal length is a standard for portraiture because of the natural perspective that it provides. On an APS-C sensor camera the 85mm F2.8 SAM functions as a 127.5mm (35mm equivalent) telephoto lens – and features a Sonnar-type optical design that is considered ideal for mid-range telephoto lenses. The lens is sharp center to corner, and features smooth defocusing thanks to its large F2.8 maximum aperture and circular aperture design. At two feet, the minimum focusing distance is the shortest in its class, and SAM motor technology ensures smooth autofocus operation. The quality optical and mechanical features of the lens mean it is suitable for serious photography and should more than satisfy intermediate and advanced users alike. The α560 model with the camera body and 18-55mm kit lens will cost about $750 and will be available in October. With the body only, it will cost about $650. The Carl Zeiss Distagon T* 24mm F2 SSM (model SAL24F20Z), DT 35mm F1.8 SAM (model SAL35F18) and 85mm F2.8 SAM (model SAL85F28) lenses will be available in October for about $1,250, $200, $250 respectively. The cameras, lens and a range of accessories will be available at Sony Style® retail stores (www.sonystyle.com/retail) and at authorized dealers nationwide.